You have more than six hundred muscles in your body. Pick one of those muscles at random—say one of the eight in your tongue. Its cells will contain protein fibers. These consist of long chains of amino acids, which in turn contain nitrogen atoms. Now pick, at random, one of those nitrogen atoms. For storytelling purposes, let us refer to it as Atom. It turns out that Atom has quite a history, as do all your atoms. You became part of Atom’s story when Atom became part of yours. This probably happened long after you were born; indeed, it is unlikely that any of the atoms in your newborn self are still with you. Those atoms have departed, only to be replaced by others. And besides the replacement atoms, many other atoms have joined you; otherwise, you wouldn’t have grown as much as you have since emerging from your mother’s womb. 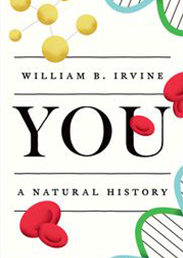 Atom would have entered you as a component of the food you ate—more precisely, as part of the proteins you consumed. It might, for example, have dwelled in a piece of steak. After you swallowed that piece, its protein molecules were torn into their constituent amino acids by your digestive system. Those amino acids then entered your bloodstream and the one with Atom was subsequently taken in by a tongue cell. The steak would, of course, have come from a cow. Before becoming part of that cow, Atom might have been part of a clover plant that the cow ate, and before that, part of an ammonia molecule that the plant took in through its roots. Previous to that, Atom would have been part of a nitrogen molecule, drifting through the air. These molecules consist of a pair of nitrogen atoms, and they are the primary component of the earth’s atmosphere. For Atom to move from a nitrogen molecule to an ammonia molecule required some radical chemistry. It might have taken place in the reactor vessel of a fertilizer factory: in the Haber process, nitrogen molecules are mixed with natural gas and steam under very high temperatures and pressures to produce ammonia. Alternatively, the nitrogen molecule to which Atom belonged might have been struck by lightning and thereby become part of an ammonia molecule. And finally, Atom could have become part of an ammonia molecule inside one of the rhizobia bacteria that lived on the roots of the clover plant that the cow ate. It is conceivable, for example, that besides dwelling in you and maybe a cow, Atom might have spent time in, say, Napoleon and, long before that, in a dinosaur. Before drifting through the atmosphere, Atom would have had many other adventures. It is conceivable, for example, that besides dwelling in you and maybe a cow, Atom might have spent time in, say, Napoleon and, long before that, in a dinosaur. Push further back and we arrive at the moment of Atom’s “atomic birth.” Atom didn’t come into existence in the Big Bang, 13.7 billion years ago. That event yielded only hydrogen and helium atoms, along with a few lithium and beryllium atoms. The formation of other elements required the presence of stars, and the first of those would have appeared about 200 million years after the Big Bang. In those stars, hydrogen and helium fused to make heavier atoms, including nitrogen. Subsequent stars would have been even more efficient in their nitrogen production. It is important to realize that Atom would have been formed not just inside a star, but in the very core of that star, where the pressure and temperature would have been incredibly high. Realize, too, that in order to become part of you, Atom had to be liberated from that star and that the only way this could happen was for it to blow up. The debris of that supernova event would have provided building material for the Sun, for its planets, and not to be forgotten, for yourself. This, in turn, means that Atom existed before our Solar System did. Conclusion: Atom, that randomly selected nitrogen atom in your tongue, is at least 4.5 billion years old. One final thing to keep in mind is that Atom will go on to have new adventures after you die. If your body is cremated, the newly-liberated Atom might again drift through the atmosphere and might subsequently become part of an oak. If you are instead buried, Atom might come to reside in one of the muscle cells of a nematode worm that feeds on you. It is unclear whether “you the person” will enjoy an afterlife, but there is every reason to think that someday, some of your constituent atoms will again play a role in the life process. We could, perhaps, think of it as your “atomic afterlife”? Featured image credit: Atmosphere Representation Nitrogen by WikimediaImages via Pixabay. I don’t know how you come to this conclusion. If you throw a cup of water into the ocean, and then 20 years later take a cup out it is almost a certainty that a water molecule from your original cup is in the cup you take out. Since there are over a 1000 times more molecules of water in a cup, than cups in the oceans, say that this number is N. Then taking a cup out is taking 1000 N samples of a water molecule, where the chance that it was in the original cup is 1/N. the atoms In me being around for longer than we can calculate with the carbon half valuation test for example, when something has carbon atoms in it, like we humans have, and computerprograms propably don’t have. It’s for those atoms in me a time where they experiencing a completely turned up online surfing and privacy is something that probably is some word only existing in history books. what and why is this going on with me and when is internet trustworthy again?